The Gerroff was reputedly named, because of John's habit of shouting "Gerroff" each time the fly attracted the unwanted attention of small fish as it slowly sank down to the depths where the large quarry were. The slow sinking that trout find so alluring is achieved by small body on a slightly longer hook. Thread : Dark red or black. Body : Dubbing mix 3 parts olive brown to 1 part pink seal's fur. Back : Clear pvc or shrimp foil. 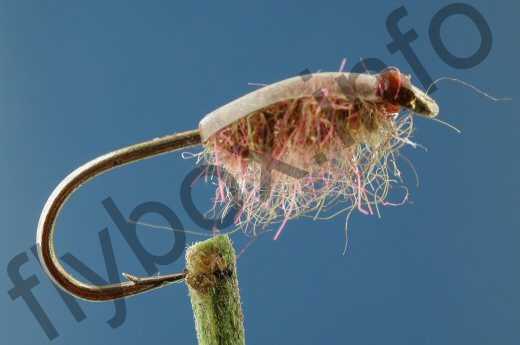 The body is only on the front half of the hook. Longshank. Currently there are no comments about the Gerroff fly pattern from other fly fishermen yet.